New FAQ for AncestryDNA and notes on the "First Look"
It's too early to reach any solid conclusions, but now that I have had some time to spend looking around a bit, I have a few thoughts to share from the "First Look" at Ancestry.com new autosomal product, which apparently they have named "AncestryDNA"- see FAQ below. *The biogeographical ancestry analysis looks superb, hinting that Ancestry.com may indeed have access to Sorenson's extensive reference samples. * - So far, I have seen British Isles, Central European, Scandinavian, Southern European, Russian/Persian/Turkish (odd grouping), Eastern European, East Asian (includes Siberia/China/Southeast Asia), Finnish/Volga-Ural, Native American and Other, plus the German, French/Swiss and the African tribes that we saw on WDYTYA - Bamoun, Brong, Yoruba and Igbo. I hear there are also Middle Eastern and North African categories. The announcement on my DNA page says, "We expect over time to deliver even more granular results (including regions within a specific country) as we get more data." This tells me that the BGA will continue to be the strongest part of this product. This is fitting since the majority of non-genetic genealogist seem to be most interested in this part of their results. *Links to and comparisons between the matches' family trees and exploration of shared "ethnicity"* - This feature benefits from a very nice presentation. It is definitely a step in the right direction - to streamline the time-intensive process of investigating autosomal DNA matches and discovering their ancestral commonality. 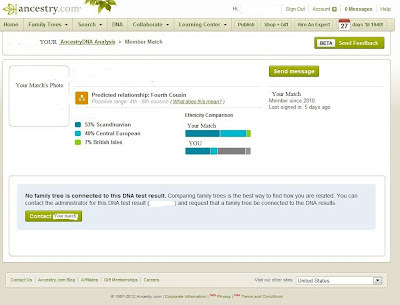 It sounds as if at least half of the users have already attached their results to their Ancestry.com family trees. This is indeed promising. *Match Lists* - So far I have heard that the current BETA testers have a match list anywhere between low 30's to upper 80's. However, apparently, some of the matches appearing on the lists have not yet received access to their results. Ancestry.com appears to be have made a decision to appeal to the layman by "dumbing down" autosomal genetic genealogy. It is a good marketing plan to attract the non-genetic genealogist, but I just hope it is not Ancestry.com's end-game. AncestryDNA™ is a new DNA product from Ancestry.com that revolutionizes the use of DNA with family history. This test combines advanced DNA technology with the world’s largest online family history resource to provide genetic ethnicity and help discover new family connections. When can I get the new test? The new AncestryDNA™ test will be available on Ancestry.com in the coming months. If you are interested in the new DNA test, provide your email address at www.dna.ancestry.com and we’ll notify you when the new test is available. I live outside the U.S., when can I get the new test? Ancestry.com is currently launching the new AncestryDNA™ test to the U.S. market. We hope to make it available to markets outside the U.S. in the near future; however, we do not have a date for this yet. Why would I want to take this new test? This new test utilizes some of the latest science & technology in DNA testing for family history. Both males and females can take this test. Your results include genetic ethnicity information, along with matching you to others who have also taken the test and are related to you. It tests over 700,000 markers as opposed to the 33/46 tested with the Y-DNA test. The online experience has been updated to better view your results. The names of those with whom you share matching DNA are provided, including links to their family tree (if they have connected it to their DNA results), as well as a clear presentation of common surnames and "ethnicity". The biogeographical ancestry analysis looks superb, hinting that Ancestry.com may indeed have access to Sorenson's extensive reference samples. At this early juncture, there appears to be no specific segment info provided (i.e. - location of shared DNA), nor raw data access. If this continues to be the case, it will be extremely disappointing for any serious genetic genealogist. Lauren Mahieu has posted a review and additional images on her blog GeneJourneys. Notably, she has 85 matches already! My thoughts on this "First Look" here. As the anticipation is building about our new DNA product, I want to make sure you are privy to the latest news. In the next week or so, we will be starting to open early access to the AncestryDNA BETA site for our earliest testers. As DNA results become available, we will be notifying these early members so that they can view them. This process will continue over the next few weeks as results roll out. Your DNA results will also be available soon...We are very excited to share our new product with you. The long-awaited launch is near, although I have been told that I will not receive my results in time for my scheduled presentation at North San Diego County Genealogical Society’s DNA Interest Meeting on March 15th. I guess I will have to find a new subject...If you were going to attend what would you like to hear? 1. An article on the site Seeking Alpha reveals that during fiscal 2012 Ancestry.com has already invested between $10 and $15 million in their new DNA service. That is a huge investment. If they have spent their money right, genetic genealogists may be in for quite a ride. On Feb 16th, the author's opinion was this, "[T]he company's earnings trajectory has been jeopardized (due to DNA), that growth in the UK will be challenging, and that NBC might not renew Who Do You Think You Are for the fourth season next year. Overall, we think management can do better." Hopefully, we won't all be feeling the same way when their new DNA product finally launches. Since the latest episode of WDYTYA featuring Reba McEntyre had a huge jump in ratings with a "stellar 7.5 Million viewers", the stock review site has now revised their opinion and rates Ancestry.com "a buy", apparently regardless of their huge investment in DNA. The analyst writes, "[T]here appears to be a strong and growing interest with people wanting to know more about their ancestry. Consequently, Ancestry.com, Inc. appears poised for continued above-average growth in the future." Let's hope the analyst knows what s/he is talking about! 2. This week the international media has been reporting that Oetzi The Ice Man's full genome has now been sequenced. Judging by the paper in Nature Communications, this must have actually happened some time ago. [I was under the impression that this was old news because I watched a program on NatGeo that discussed these very details last year. I believe it was in November 2011.] Regardless, Oetzi has been getting lots of press this week with his particulars being publicized far and wide, "...the Iceman probably had brown eyes, belonged to blood group O and was lactose intolerant. His genetic predisposition shows an increased risk for coronary heart disease." 3. Last Monday, 23andMe commemorated Rare Disease Day by campaigning to increase the enrollment in their studies on myeloproliferative neoplasms (MPN) and sarcoma (with free kits offered to those suffering from these diseases). By Friday they announced that they had reached their goal of 500 for MPN and were "just a few participants shy of 800 for Sarcoma". 4. Finding Your Roots With Henry Louis Gates, Jr. will premiere on March 25 and run Sundays through May 20 at 8 pm ET on PBS. This 10-part series will be similar to NBC's hit "Who Do You Think You Are? ", with Gates investigating the family trees of his celebrity guests (Kevin Bacon, Robert Downey, Jr., Brandford Marsalis, John Legend, Martha Stewart and Barbara Walters are a few). The great news is that it appears that there will be more of a focus on genetic genealogy than on WDYTYA. The Spittoon notes "Gates uses history and science, including 23andMe’s ancestry tools, to explore race, family and identity in each episode." Especially exciting, two of the scientists from 23andMe will assist Gates and his guests in discovering their genetic roots. I very much enjoyed Gates' last series "Faces of America" and am really looking forward to this new series.